AIMA and TCS have entered into an alliance to offer Professional Diploma in Management Programs (PDM) with seven specialization streams, through TCS iON’s Digital Hub portal. Through this alliance the PDMs will be available and delivered to a larger number of learners from across the country. iON Digital Hub, is a powerful online learning, collaboration and assessment portal with a very wide reach, that provides interactive learning for improved outcomes. It offers a collaborative pedagogical model to enrich participatory learning by enabling course delivery, assessment and other learning opportunities in a community setting. The recent growth in the Indian economy has triggered an increased demand for skilled and trained human resource in the industry. The Conventional System of Higher Technical Education so far, has been unable to cope with this situation and it is highly likely that this gap between demand and supply may retard the growth of Indian Economy in the coming years .The industry is now looking at the pool of diploma holders or vocational degree holder to be groomed and honed with professional management skills to take higher responsibilities in organizations and take decision making roles .This move can also help in integrating the massive pool of technical diploma holder in Management field. 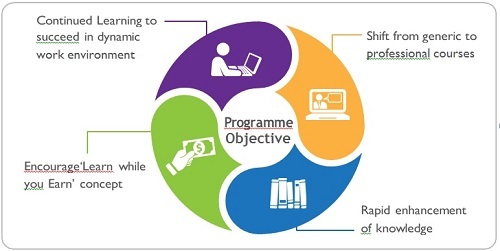 The Professional Diploma in Management (PDM) programme allows students who have passed the 10th standard examinations and hold 3 year ITI certificates/ diploma/ vocational degree, to pursue a higher qualification (Graduation / 10+2 Diploma holders/ 3 year ITI certificates/ diploma) and earn Professional Diploma in 7 functional areas of management i.e. Human Resource Development, Finance, International Business, Marketing, Pharmaceutical Marketing, Retail Management and Operation Systems. Continued Learning as learning is an ongoing process, new knowledge are required since working environment is dynamic. Learn while you Earn concept. Quickly enhance knowledge in specific area of management without the burden to study General Management concepts. Provide the opportunity to general Post graduate students to shift to professional courses through lateral entry schemes. India’s retail sector is estimated to touch US $865 billion by 2023, with a compounded annual growth rate (CAGR) of 6%. The organised retail is stated to grow at 40% per annum and expected to touch US$107 billion. It is the 5th largest retail destination in the world. Retail contributes 8-10% to India’s GDP. This industry directly employs about 300,000 people and the demand is rising with every new store addition. To harness the emerging opportunities in the area, this programme is designed to impart integrated knowledge of merchandising, supply chain, store maintenance, inventory control, and retail marketing mix apart from customer relationship management. Professionals/ working in a retail organisation to upgrade their professional skills. Freshers looking forward to excellent job opportunities in this sunrise sector. Management professionals working in other sectors to develop retail management competencies. This course is designed to develop conceptual & practical Human Resource Skills for eVective management of people and organisations. This programme enables one to take higher responsibilities in HR. It also prepares young managers to meet the challenges of a globally competitive environment and harness the asset for countering business challenges in the global era. Professionals seeking to renew fundamentals. Professionals working in other functional areas aiming to shift to HR functions. Graduates/10+2 Diploma holders working in BPO, KPO or working in teams aiming to develop human asset management skills. The Programme covers the concepts and techniques of modern finance and enables the student to analyze and understand the behaviour of the modern financial market; to explore the range of factors influencing financial decisions; to understand modern corporate financial management; to examine the role of financial risk management within business organisations and thus equip him/her with skills and knowledge for a career in the financial sector. Professionals aiming to shift to financial functions. Freshers looking to enhance their knowledge in financial areas. Graduates/10+2 Diploma holders looking for specific skills to increase their job opportunities. This programme is designed to equip young managers and students for leadership roles in the face of global business challenges. The course is structured to impart integrated knowledge of international marketing skills, trade policy implications, contemporary trade finance tools, export-import documentation and International Human Resource Management. This programme makes a bold attempt at delivering a balanced mix of export-import marketing and export procedural elements. Professionals seeking to get knowledge of International Marketing Environment. Professionals aiming to reallocate to Global Markets. Graduate/10+2 Diploma holders looking to enhance their knowledge in International Business. The Pharmaceutical industry of India is an ongoing giant with an annual turnover of Rs. 269 billion. The future market size is projected at US$45 billion by 2020 (Mckinsey Report) Indian Pharma market will be 6th largest in World by 2020. Presently the industry directly employs over 5,00,000 people, while 24,00,000 are indirectly employed. AIMA-CME with its expertise has delivered this programme to two pharma giants and is now ready to deliver the programme to the masses. This programme is designed keeping in view the present set of skills and the target audience to develop the required technical expertise in them to harness the enormous employment opportunities available in this area. Garduate/ 10+2 Diploma holder with experience and looking for quantum jump in their career. Freshers looking to enhance their specific management skills required in this highly technical area. Professionals already working in dynamic position in other sectors who need specific competency in rapidly growing sector of pharmaceuticals. Operation management is the area of business that is concerned with responsibility of ensuring that business operations are eVective. There is demand for qualified professional in area of professional systems as the production, sale and post sale activities have to be integrated. Career opportunities are enormous in the are of Automobile, Manufacturer, Pharmaceutical, Telecommunication, Oil & Gas and all Banking Sectors. Graduates/10+2 Diploma holder working in production, manufacturing and allied companies. Professionals working in area of supply chain, retail, projects and services. Freshers looking for rewarding careers in backened operations. The All India Management Association (AIMA) is the national apex body of the management profession in India. Over the last five decades, AIMA has contributed immensely to the enhance- ment of management capability in the country. AIMA has a broad base of 66 Local Management Associations including two cooperating LMAs abroad, with a membership crossing 30,000 in number. AIMA is a non-lobbying organisation, working closely with Industry, Government, Academia and students to further the cause of the management profession in India. AIMA is represented on the Boards of India's premier Business Institutions like Indian Institute of Management – IIMs. AIMA is also represented on Boards of Government bodies including the All India Council for Technical Education, National Board of Accreditation, National Productivity Council to name a few. AIMA makes a salutary contribution to management learning and practice in the country by oVering various services in the areas of testing, distance education, research, publications and management development programmes. AIMA brings to the Indian managers, the best management practices and techniques through numerous foreign collaborations with professional bodies and institutions. AIMA is a member of the Asian Association of Management Organisations (AAMO) and works closely with several international management institutions like Robert H Smith School of Business at the University of Maryland, St Gallen Foundation etc. in organising international conferences and management development programmes. To know more please log on to www.aima.in. TCS iON is a strategic unit of Tata Consultancy Services focused on manufacturing industries, educational institutions and exam boards. We provide technology by means of a unique IT-as-a-Service model, oVering end-to-end business solutions for the sector. TCS iON caters to the needs of multiple industry segments, through innovative, easy-to-use, secured, integrated, hosted solutions in a build-as-you-grow, pay-as-you-use business model. We serve our clients with the help of best practices gained through TCS’ global experience, domestic market reach, skills, and delivery capabilities.